Dr. Wang currently serves as adjunct assistant professor in the Department of Chemical and Biological Engineering, as well as associate scientist at the Ames National Laboratory of Department of Energy at Iowa State University. He got his Ph.D. in Chemical and Petroleum Engineering from University of Kansas in 2010. He obtained another Ph.D. in Environmental Science and Engineering from Wuhan University in 2007. Before he joined Iowa State University in 2012, he has worked as Jorge Heller Postdoctoral Fellow in Harvard-MIT Division of Health Sciences and Technology of MIT and Harvard Medical School. 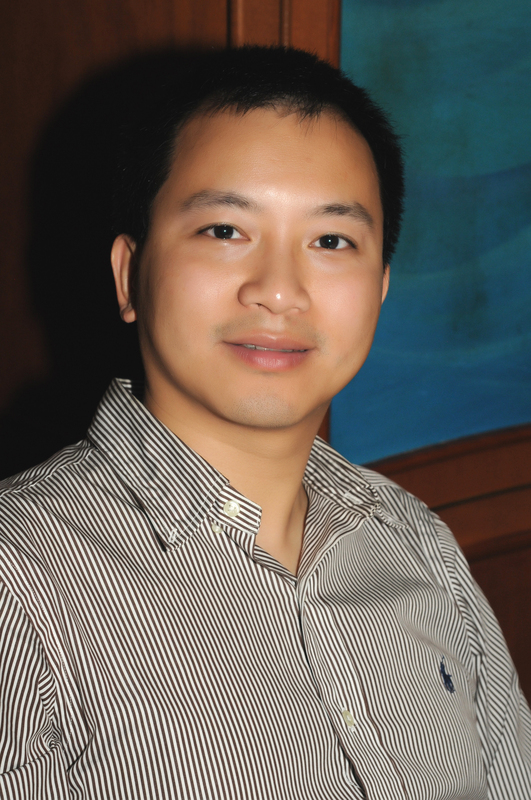 Dr. Wang has worked as engineer in a chemical company and a pharmaceutical company before. Dr. Wang’s areas of interest include Biomaterials, Intestinal Tissue Engineering, Nanotechnology, and Drug Delivery. In Iowa State University, Dr. Wang BINDs his research in these areas to produce innovative solutions and products for improving human health. Specifically, the current research in the Wang Laboratory focuses on intestinal tissue engineering based on intestinal stem cells, biomaterials mediated stem cells reprogramming, and cell-mediated drug delivery. My research can contribute to the diagnosis，treatment, and prevention of gastrointestinal tract related diseases, such as antimicrobial resistance, inflammatory bowel disease, diabetes, obesity, oral drug and substance abuse, intestinal infection, HIV/AIDS vaccination, and colorectal cancer. Moreover, discovery of substrates, pathways and growth factors involved in the differentiation of intestinal stem cells into specific lineages is expected to contribute significantly to the clinical protocols. The multidisciplinary research background enables Wang Lab to accomplish these goals. The ongoing projects include investigation of ex vivo culture systems of intestinal stem cells, development of new administration systems of intestinal stem cells, intestinal stem cells reprogramming, and oral drug delivery systems targeting to intestinal mucosa. Dr. Wang has successfully administered the projects, collaborated with other researchers, and produced several peer-reviewed publications from each project as documented in the peer reviewed journals. He has 82 peer-reviewed manuscripts in scientific journals. Notably, Dr. Wang is the corresponding senior author or first author in 59 of these papers. He has 26 invited lectures and presentations at different research institutes and premier meetings of professional societies, including the Controlled Release Society, the American Association of Pharmaceutical Scientists, and the Society for Biomaterials. Moreover, 19 peer-reviewed conferences proceedings or abstracts have been accepted for poster presentations. Dr. Wang has 6 awards from scientific societies and professional organizations. His inventions have led to a series of patents. Dr. Wang’s work has been frequently recognized and cited by other researchers from around the world. His personal H-index is 42, and the total citation is over 4,400 (Google Scholar). As a measure of Dr. Wang’s work in the fields of chemical and biomedical engineering, he has received numerous prestigious awards including the Lloyd Mayer Scholar, McGee-Wagner Interdisciplinary Research Award (ISU), PhRMA Foundation Research Starter Award, and Crohn’s & Colitis Foundation of America Career Award. These awards clearly recognize his contributions to improve the quality of life for humans afflicted with chronic, debilitating diseases. Dr. Wang’s reputation is also recognized by various academic societies as he serves as Editor, Associated Editor and Editorial Board members for prominent scientific journals. For example, he is the Editor of Royal Society of Chemistry (RSC) Smart Materials Series. He has served as Associate Editor of Journal of Biomedical Nanotechnology and is an Editorial Board Member of the International Journal of Pharmaceutics, Molecules, and Heliyon. He also has served as Session Chair of the Biomedical Engineering Society (BMES) Annual Meeting since 2013. He also has served as study section member for the National Institute of Health (NIH) and panel member of the National Science Foundation (NSF). Dr. Wang will continue to employ his multidisciplinary expertise in the areas of materials science, stem cells, microfabrication, and pharmaceutical chemistry to address and resolve challenging problems of human health. In addition to pursuing cutting edge scientific research, Dr. Wang has also committed to a career of teaching, not only in the classroom, but also in the laboratory. Recently, Dr. Wang has brought together scientists and engineers what work in different fields of chemistry, physics, biology, materials science, pharmaceutics, medicine, and clinics to write two books “Smart Materials for Tissue Engineering: Fundamental Principles” and “Smart Materials for Tissue Engineering: Applications”. These two books aim to fill this gap and tries to introduce new tissue engineering smart materials to a wide audience, from the scientific communities, educational organizations, to industrial manufactures. Summer internship, worked as a formula scientist in orally disintegrating tablet (ODT), oral transmucosal (OTM) and oral powder drug delivery technologies. Worked as an engineer and took charge of product quality controls; dealt with company’s public relationship with local governance.